If you have feelings of hopelessness and your quality of life is less than you want it to be, you are probably suffering from depression. Most people reach out for medical help and drugs when they are suffering from depression, yet statistics show suicide rates increase among those who are taking anti-depressants. In fact, some studies indicate that anti-depressants are no more helpful than a sugar pill, but with a higher risk. Seeking medical help for depression is not bad, if you balance it with the other aspects necessary for healing to take place. Medical solutions typically only address the body, while the mind and spirit are ignored. Using energy healing, including sacred geometry as part of your practice along with changes to your mindset will be a far more effective solution to relieve your depression. Exercise – Move around and give your body the energy it needs by doing physical activities. This can include, walking, running, dancing, swimming, stretching or working out at the gym if that is your preference. Simple movement contributes to your mindset as well as an overall energy healing plan to help relieve your depression. Remember energy healing is all about shifting the energy to a healthier state and body movement helps. Sunshine – The sun is another energy healing tool, with your skin exposed to the sun you can get the vitamin D you need, and that is one of the best natural ways to get relief from depression. Eating – Eat healthy and reduce your intake of carbohydrate (simple carbs) foods from you diet as much as possible. Eliminate as much sugar as you possibly from your diet as well. Eat several small high quality meals throughout the day to keep your blood sugar and metabolism more evenly balanced. Many people find that eating healthy snack size meals every 2-3 hours makes a huge difference to how they feel. Doing so eliminates the highs and lows throughout the day and can help with depression. Water – Drink plenty of water, some studies indicate that you should drink oz of water for every 2 lbs of body weight. You can energize your water by charging it with sacred geometry Krystagraphs for enhanced energy healing support for relieving depression. A key component in energy healing is to clear negative feelings and emotions that are playing havoc in your mind every day. Identify those repetitive negative thoughts by journaling and keeping a log of each negative thought that is repeating in your mind. You can also use the Sacred Geometry image called Straight Path to Core Beliefs to more quickly uncover those beliefs. Create a list of powerful affirmations and repeat them several times throughout your day. You can also use the Installing New Beliefs Sacred Geometry image and process found in my books, to help you change the negative beliefs permanently in just one brief session. Listen to subliminal recordings with powerful positive affirmations, specifically that will reach your subconscious mind to support your mindset and energy healing, by helping to shifting your beliefs on autopilot. People who are suffering from depression have usually shutdown their Crown Chakra. You can resolve this in less than 20 seconds by using the Chakra Opening Sacred Geometry Krystagraph for a quick energy healing tune-up. 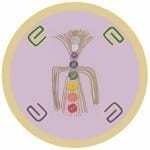 For more direct and powerful energy healing work to relieve depression use the Crown Chakra Sacred Geometry image to deepen your spiritual connection and increase you spiritual energy. Healing starts when you open up this connection to your spiritual self. Although depression can begin to subside by this simple energy healing method of opening your chakras, you will want to do additional energy healing work by doing the things listed above and also starting a practice of daily meditation for at least 15 minutes per day. For best results to take your energy healing to a deeper level, I recommend 15 minutes twice per day. Some people have found that using the sacred geometry Krystagraphs helps them quiet their mind more easily and take their meditation to a deeper level. Blossom – Happy that you enjoyed the tips. A depression relief healing kit will be available soon, with the Krystagraphs mentioned in the article.